D2X-Rebirth - Many improvements and enhancements, while maintaining the original feel of Descent 2. Basically the spiritual successor to this project. D2X-XL - Also has many improvements and enhancements, particularly in the area of new effects and gameplay features. 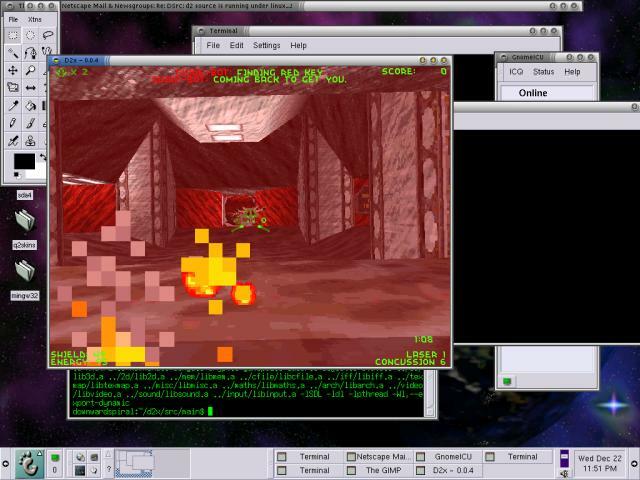 Descent 2 for DOS, Windows, and Unix (Linux, Solaris, Mac OS X, etc). d2x can also run on handhelds like the Pocket PC and the Nokia internet tablets. This project does not often have up-to-date binaries available, I always recommend compiling from SVN to get the latest features and bug-fixes. What we do have is available here. If you are a past contributor to d1x or d2x, your old cvs login does not tranfer over. Send me an email and I can give you access to svn. You can also browse the cvs history of d1x online, with cvs2html. It is generated once a month or so. D1X Project, from which d2x borrows heavily. If you fix a bug or add a feature, send it in a patch! Either attach it to the relevant bugzilla bug, or send it to the mailing list. Questions about d2x can be best answered on the descent-source mailing list. see the D1X Developer Resources page for the archives and subscription information. org.